Lizzie and her dad have just moved to the countryside. Lizzie loves her new home but she feels lonely as she has left all her old friends behind. She yearns for new ones and dreams about what they will be. 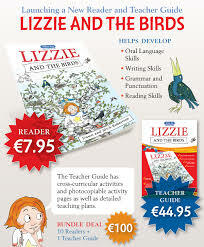 Lizzie and the Birds is a wonderful story that will engage young and old. This many layered picture book explores the themes of love, friendship and trust. Enter a rag-taggle group of tweeting, squawking birds who could be the answer to all of Lizzie’s problems, if only she can persuade her cat, Buster not to eat them, and her dad to share their house with them. What could be easier! Can her brand new feathery friends, like Rainbow Bird, Cheeky, Chif and Chaf, Egglet and Crow, really help Lizzie save their beloved tree and fill her life with fun? Well, what would you do to save your friends? This gentle story is packed with humour, lots of chirping heroes, bird-banter and the message that true friendship comes in many different shapes and sizes!